Disney World announced their new ticketing system last year, and part of that new system included Magic Bands, which are bracelets that park guests wear instead of carrying a paper ticket. The bands didn't become widely available until last month, with only guests staying at certain Disney hotels getting them until now. Last month, annual passholders finally got a chance to order the bands, and just last week, they were made available to general day guests. Hotel guests and annual passholders get the bands for free, general admission day guests have to pay $13 extra. As annual passholders, we got our bands a few weeks ago and have used them several times now around the parks. Here are my thoughts. The bands are comfortable and easy to wear. Disney sells a huge assortment of accessories for customizing your band (because, of course they do), but I just wear it as is. There are also endless ideas online for customizing your band at home (colored nail polish is the trick). But even without any personal touches, the band doesn't bother me on my arm, even wearing it all day. So far we have only had one instance of the band unclasping and falling off, but it was probably related to it getting caught on something. Otherwise they stay snug and secure. To get into the park now, you need your magic band and your fingerprint. To access fastpass rides (more on that in a moment), you simply need to touch the band to the terminal at each ride. If it glows green, your fastpass is valid and you're good to go. Another big change to the theme parks this year was the complete removal of the old Fastpass system. No more paper tickets, no more hiking to each ride to get the fastpasses you want. It's all gone. 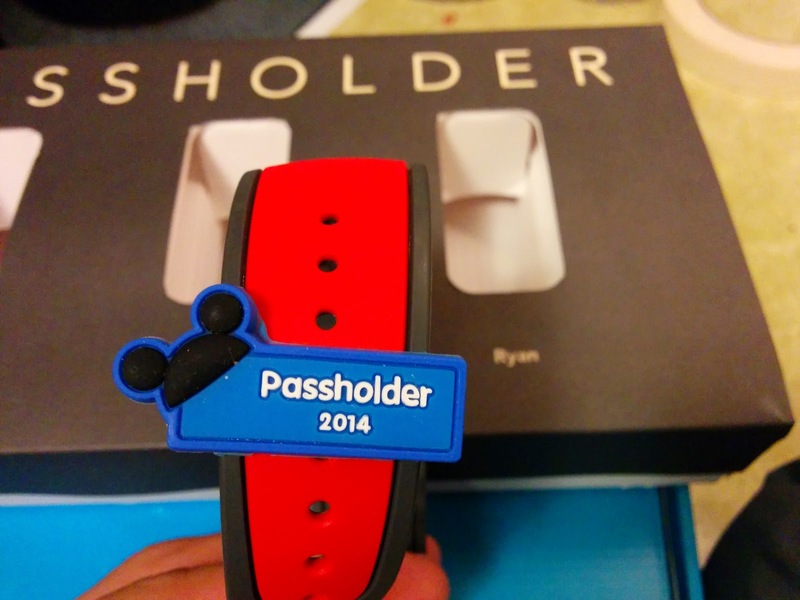 Now fastpasses are done digitally and redeemed using your park ticket or magic band. Fastpass+, as the new system is called, now works by making reservations in advance for the rides you want. Hotel guests can make their reservations up to 60 days in advance, annual passholders up to 30 days in advance, and regular day guests can make their reservations at special kiosks when they enter each park. The kiosks can also be used to change reservations, ask questions, or anything else related to fastpasses. Disney also has smartphone apps for Android and iOS that guests can use to make their reservations. What we typically do is make our fastpass selections the day before our visit. It means we can ride Soarin' on each visit to Epcot now, instead of hoping and praying that fastpass slots will be open when we arrive at the park. So once you've picked the rides you want from the app, website, or kiosk, you wait until your scheduled time to return. You get the same one hour window as with the old system. When you get to the ride, you just touch your band to the terminal and it turns green. Super easy. This is a real concern for some people. A teardown of the magic band reveals the existence of two antennas inside, as well as a tiny battery. One antenna is short range and unpowered. This is the same type that is inside the plastic cards for guests who don't get magic bands. It is used for park entry and fastpass entry. It requires the band to be within an inch or two of the receiver. The second antenna is a long range antenna that stretches into the strap of the band, making this a surprisingly big antenna. The presence of a battery inside means this larger antenna is powered, allowing the band to actively broadcast information. What this means is that Disney is able to track band movement around the parks. Some people get really freaked out by this idea, but let's discuss what they're most likely using it for. First of all, a bit of a reality check. Almost all of us carry mobile phones these days, which can already be used to track you everywhere you go. Don't be fooled: your mobile carrier knows exactly where you are and where you go. All the time. And they have simple systems in place for sharing that info with law enforcement if needed. So are you really going to worry about Disney tracking your location within the theme parks? Secondly, Disney definitely doesn't want this information to be creepy. Picture park executives in a dark room, looking at a monitor. "Look, there's Ryan again, making another visit to the churro stand. Dude's got a sweet tooth today, HAHAHA!!" No, what they're really looking for is something called big data. Companies all over are coming to see the power in big data and are working on ways to gather it, even if they don't necessarily know what to do with it yet. Imagine a scenario where every single guest at a Disney park has a magic band on. The company now gets a real time, highly accurate picture of crowd movement down to the minute. They can see what rides are more popular at what time of day; which restaurants are more popular in hot weather vs cold; how many guests turn and head toward the music when they hear the parade starting; where guests congregate when it starts raining. This kind of information is hugely valuable to them, and can only be gathered accurately if each guest is wearing a band. It can be estimated by other means, but this method makes it perfectly accurate down to the minute. Once they have this information flowing in constantly, they can use it to make intelligent crowd control decisions, which is important seeing how park attendance is up every year. The convenience factor of using the app to reserve fastpasses, and simply touching your band to enter the park and use them is really high. I didn't expect to find that much more convenient than using a plastic card, but it really is. If you're visiting the parks for a vacation, I highly recommend getting magic bands. As for the privacy aspect, I don't mind it personally. I understand how they're using the information, and if it results in a more pleasant park visit for my family, then I'm all for it. Time will tell if they are actually able to use the data intelligently. The system is still in its infancy, so we'll see where it goes.